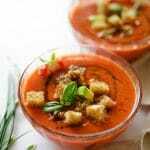 This savory Strawberry Gazpacho is a light and refreshing cold soup that will keep you cool this summer! Preheat oven to 450 degrees F and set red pepper directly on the rack. Roast for about 25 minutes, until slightly blackened and charred. Remove from oven, set in a large bowl, and cover bowl with plastic wrap. Let sit about 5 minutes, until skin is loose, then remove skin, stem, and seeds. Put all of your gazpacho ingredients into a food processor. Process until smooth, scraping down the sides as needed. Add salt and pepper to suit your taste (though it shouldn’t need much). Pour gazpacho through a wire mesh sieve to remove seeds and fibers. Place in the refrigerator to chill while you make the croutons. In a large saute pan, bring 2 Tbsp olive oil to medium/high heat. When hot, add bread, garlic (crushed but still intact), and thyme (on the stem). Cook for about 5 minutes, until bread is golden brown and crispy. Remove garlic and thyme. Recipe from Live Eat Learn at https://www.liveeatlearn.com/roasted-red-pepper-strawberry-gazpacho/.